1. Important - the 2n3904 (I used 2N5088) must be matched. I made them exactly the same hFE. Then the highly modded one. 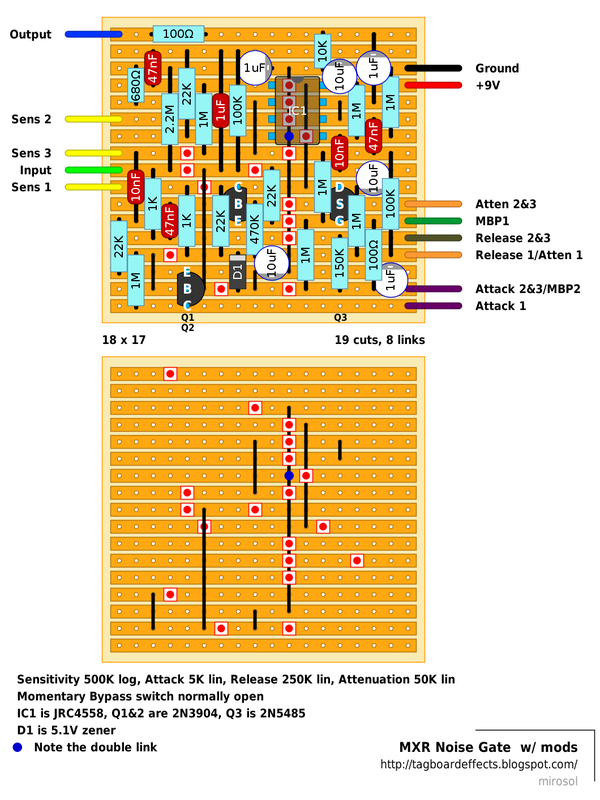 With added controls for Attack, Release and Attenuation levels. Also, added momentary single pole stomp switch - This one acts as a momentary kill switch for gate. finished the modded version and i guess you can tag it. although attenuation might be in reverse depending on how you like things, it mutes more and more the more you turn it counter-clockwise. im also unsure about the knobs, attack and release dosnt seem to do that much for me, might be my ears to. sensitivity does nothing really and attenuation gates the signal more and more. will prob strip it down to the unmodded version. setting the noisegate last in chain the sens works better as well as the rest of the knobs but it lowers the volume to much there. you loose alot of power. Great! Thanks redeez! I'll tag it right away. 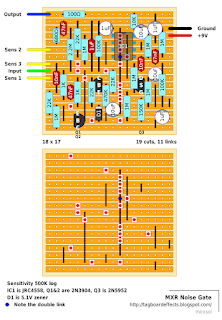 I was looking at the schematics and it looks like the Sens 1 1k resistor is connected to ground instead of Vb as shown in the schematics. Which one is correct? You're right. There was an error. I fixed it for both versions with little tweaking. Q2 E 0.00v B 0.47v C This one swings from 4.23v at min, then turning the pot up to 2o'clock voltage goes down to 0.02v then back up to 4.23v for the rest of it's travel. Anyone got any ideas? I changed the pot thinking it might be faulty but the result is the same with the new one. I just built one and it works but it has a squealing sound. I'm gonna see if i can figure out what's wrong. After that, the squealing went away, the gating is normal and the level is right. I've only made one with these changes but I'm about to build another one. I'd like to hear from others if it worked for them as well. I could probably add a modded layout, but with those changes it's no longer one with the schematic. I realised I had Sens 3 & 1 around the wrong way(Doh!!). So I changed them around, matched my 2n3904's and changed the resistors as suggested. Still there is no gating at all. When I switch it on there is no change at all to the original signal, no matter where the pot is set. That's strange. Have you checked the pinout for the JFET? Try swapping them out with others to see if there's any change. If you take out the JFET, the signal will still go through, so try taking it out while the guitar is playing and see what happens. I'm at a bit of a loss with this one!! Same with the Cook reverb. Hmm.. This and that reverb seem to be uncrackable. Errors in available schematics maybe? I think no one would mind if i take these both down? Yeah, not a problem mate. No point flogging a dead horse(circuit)...lol. 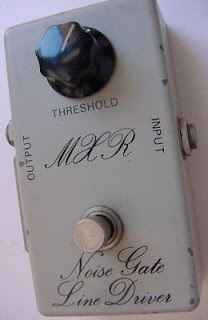 Just wondering if you had a look at the voltages I posted for the Cook reverb? I might re-check them. Mirosol, I must say that without this vero layout I wouldn't be able to buil mine. I sugest you put some warning instead of thake it down. Other option is to "tune" this thing regardless the schematic. Mine works realy good but I've made some changes. I cann't remember all the changes, but I've got them wrote down at home. I also used trimpots in place of the "critical" resistors (1M to the gate, 680R frim OpAmp and 150K for release) to find the best value. I used a 1uF tantalum instead of the 1ufNP. I belive I've done one or two more changes but I need to make sure. Hi, what's the orientation for the 1uf tantalium? I've built this twice now with those two component changes and they worked fine right away. Just built this one up using the changes you suggested, and I get some gating, so I know it's doing something. I used 2n5088s like you did, I also used a TL072 and a 2n5485 in place of the regular components. My problem is I'm getting a pretty low output level. It also seems to boost my treble quite a bit, not sure what that's about. Any ideas as to why I may be getting such a weird volume/treble issue? Is that 1uF electrolytic really supposed to go into where the cut is? Over the cut. That's one of the reasons i wanted to take this down. Thanks, got it working just fine with this info and the other info stated. A little awkward with the 1uF there but I don't see any reason it should be taken down, it works right. Might want to add a note about that capacitor or update the layout to show it though. Hi excuse me but i cant understand this over the cut thing. Does it means on the same strip but to the left of the cut? This would make sense, as the positive side of the cap would be affecting whatevers at the left of it. Please let me know because i skipped one column to do this and i really would like to know if it is correct like this as i wouldnt want to throw everything away. Thanks if you would kindly let me know, maybe as Jarrett said, add a note..
What would be the best way to add an in/out for use with the fx loop in your amp as well as using it in front of the amp simultaneously? This would isolate the preamp reducing the most noise. I can't get pot to work. I did all the changes and revers them, but nothing. When I engage pedal it works but it cuts down the volume, and pot is not working and not doing nothing. I changed few of pots but nothing. 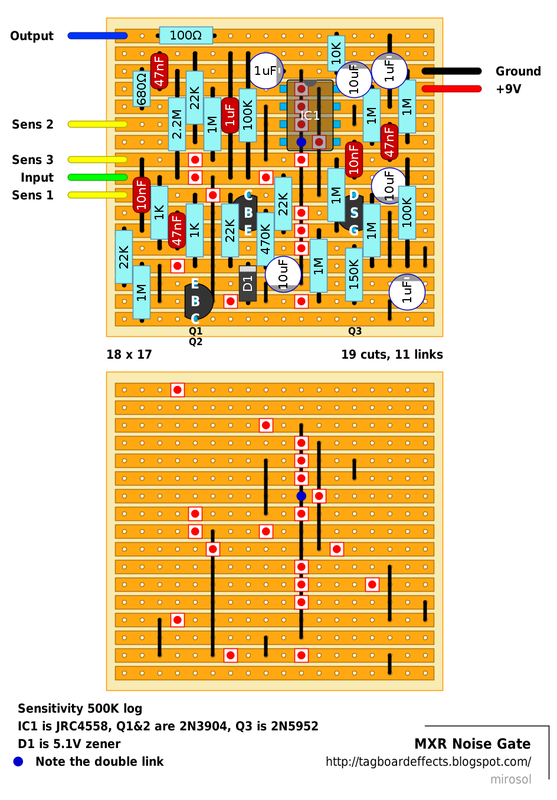 When I remove (I have socket all of them) jfet sound is even with pedal other pedal but pot is still not responding. I have changed few of jfets bu nothing. Does anyone have any idea? I built this and it works great, I used 2n3904 and 2sk168e for jfet. Thanks! there is already a 2.2M resistor from input to ground to prevent this. 3)check your supply. do you use a regulated supply?like boss or something? I tried this things, I delete Led, change switch & use 2,2M and nothing changed. Hi all. If no momentary switch is used do I simply disregard the connections to it? Hello everyone.I think its mistake conect MBP2 to Atack 2&3.It does not make sense.MBP1 is o.k.When the switch is open(normally)the same as it is not there.When the switch is(ON)MBP2 switch must be connected ground to 100R resistor.I am so done and all is well. My question is this; does the 1uF cap near the Attack and Release pots need to be non-polarized (as stated in the schem at tonepad)? Chris,these caps must be polarized. Understood - however, like I mentioned, the schem on tonepad specifically mentions that one 1uF is non-polarized. Otherwise if folks have built it here per the vero w/out the NP, then that's cool and would like to know that too. it won't make any difference at all.you can put in there anything you got. i did this in many circuits with no thinking at all, and all worked. (using 1uf polarized or non..). you just have to be sure when you're gone use a polarized in place of non-pol for+ - ..
Chris,only non-polarized is cap 1mf that parallel with resistor 100k.The underside of the bridge leads to transistor Q1 to base.From the top via to resistor 22k to IC1(number 4 is Vcc-) and trough cap 47n direct to IC1(number 1 is output 1) and resistor 1M bridge leads to IC1(number 2 Invert input 1).All other caps 1mf are polarized electrolitics. I do not agree with comment ElGrecos. (sorry,i do not know to write your name). I built the mxr noise gate and the dsp decimator. If iI had to do it again I would build the dsp. Hi! 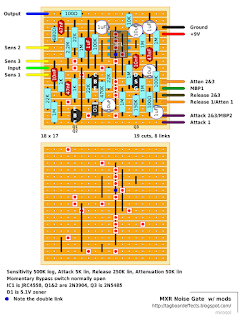 Thank you for your work) Can you make layout of electro harmonix silencer? Mine works well after the mods and matching the 3904's (within 1), but the gate doesn't release smoothly when it's set fast. The gate will open and close as my guitar note decays. Not a problem if I slow down the attack and release a bit. Any ideas, or is this the nature of the beast? That is exactly what it is supposed to do. It will chop of the signal when using a massively loaded, hi-gain sound to prevent squeals and feedback as soon as you stop playing or release the strings - think shred metal. The trick is to use it in exactly the right application, and set the threshold at exactly the right point to prevent feedback, but not chop off the note too quickly. It WILL take you some time to ind the correct setting. Build this today. I've got lots of 3904 and tryed matched and no matched, and in both cases this works. For Q3 I used 5485 instead 5952. I did what Geiri said and changed 1M to 1.8k and level now is ok. Running low with 4.7K, so I changed 680R for 8.2K and it just worked fine with no oscilations or any other problems! Boxed in a 1590B. Best regards from Brazil! Do I connect the 1mF Electro Cap (3rd row, approx middle, marked horizontal) under the leg of the 100K resistor..? If so, can/can not thouch each other..? Hi will using a 2n5457 work in place of the 5485 or 5952? What do you guys mean by matching 3904's ? Does it mean that you have to change other components or trying different 3904's? All 3904 aren't same ? I build this pedal but pot not working? I've build the modded Version to use it on my Bass guitar. The problem is that the pedal cuts away the low end. I've loked for any mistakes but I can' find anything. Do I have to adjust the entry filter for bass becaus they are adjustet for guitar, or any other Idea whats wrong ? Momentary bypass switch lug 1. Can I substitute the 2n5952 with the a J201? Built this one and it sounds really good. I was worried at first as I thought it was filtering the low mids, but I think its ok now Ive played with it for a while. I did the full mod version, but found the attack, release and MBP did not really enhance the noise gate use, but the Attenuation is a really great addition. I used Geiri's mods and Shaun Martin's suggestion of only using the attenuation mod on my build. https://puu.sh/xCWQD/28d0711755.png is the modded layout i went from. I actually had something mildly interesting happen with mine. Upon first test my bridge pickup was working correctly, but my neck pickup was making a "fwoff fwoffsh fwosff" noise that was very loud and I couldn't figure out why. I tested other guitars and the problem was localized to this one, so I opened it up, and while i was still getting sound the neck pickup wire was hanging by a thread. I just thought it was interesting that no other pedal had issue with this. so I had no idea it wasn't working fully. I bought a bunch of different transistors to play with in a big muff (pink flesh specifically) and measured the HFE of every single one to get the best match I could. Turned out that it was a pair of ~200 HFE 2n3904s. I don't know if my cheapo meter's HFE is calibrated, but I figured as long as they matched on the meter it would be ok, and it seems to be. Thanks for the layout Miro and for the suggestions Shaun Martin and Geiri. just finished the MXR NG, using 2SK30A for the fet. It works. thnx for the layout. What are the squares with a red dot inside? Those are cuts in the copper tracks. Usually made with a small drill bit twisted by hand just a few times.